Seward sits on the edge of Resurrection Bay, a deep fjord carved out by a glacier thousands of years ago. High above the town, almost 40 glaciers flow down from the Harding Icefield in the Kenai Mountains. 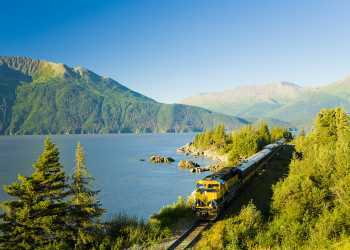 A stop in Seward can combine road-accessible glacier views with day cruises, glacial kayaking or trekking. Tour boats leave Seward small boat harbor for trips out to Aialik or Holgate Glacier in Kenai Fjords National Park. Exit Glacier, a 10 to 15 minute drive from the road into Seward, has glacier views before even stepping out of the vehicle. Ready to stretch your legs? Trekking trips set foot on Exit Glacier. Kayak and paddle trips head to Bear Glacier, the largest in the area.